This class (only) has been cancelled due to low enrollment. 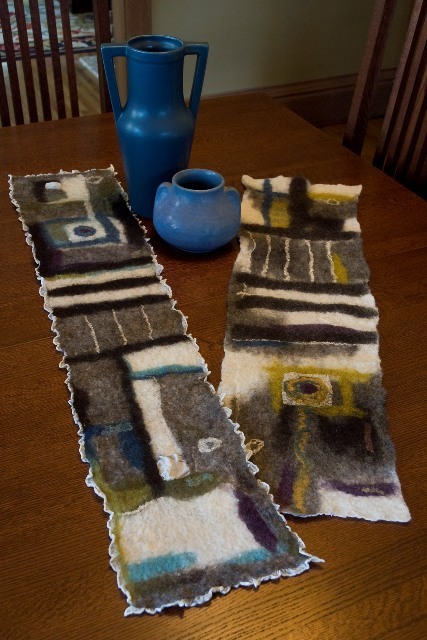 Felt a beautiful table runner or wall hanging using wool from local sheep. 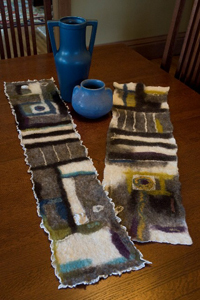 Learn to layer naturally colored fibers, and then add texture and color with a variety of embellishing techniques. Add your own creative touches for a one-of-a-kind accessory. 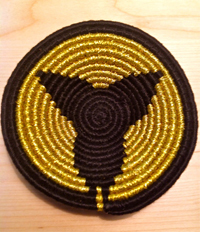 Please register by end of December 2014 to give the instructor time to order supplies. plastic bag to carry home wet items. 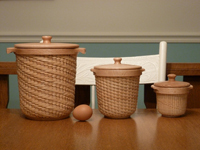 These beautiful baskets are woven on molds with cane and will nest inside one another. You have a choice of oak or walnut wood, which needs to be specified when you sign up. Students do not need to bring anything. Have a project that you want to finish but need help? 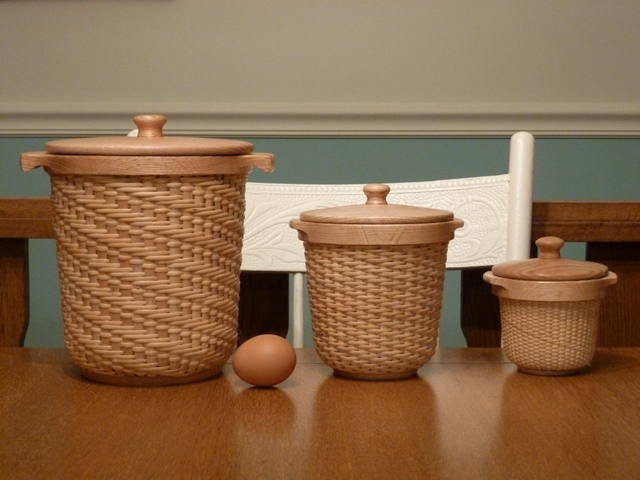 Or just want to talk about baskets? Check out the Open Weave Table. You might want to bring a small pair of scissors, and if you'd like a notebook for notes. On a pre-drilled antler frame, using a variety of textured and colored materials we will make a dramatic antler basket, that is visually appealing and functional. Along the way, we will learn the skills of “short-rows” making decisions of when to add spokes, and finishing with accents of feathers and antler button to complete the look. I will make myself available for those who don’t finish at open-weave table the following month. 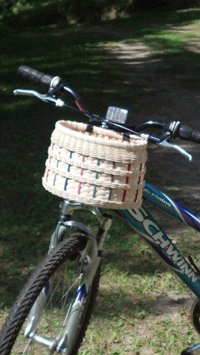 An "old school" bike basket. Great for carrying necessitites on your future bike outings. Built on a wooden base, it attaches to any handlebars with velcro, adjustable straps. Color choices are available to compliment your bike. Happy Trails! A basket made from a star! This is a fun basket starting with a star base. 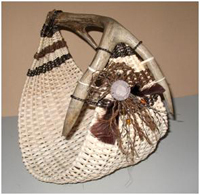 Beads and different weaving strategies are used such as twining, chaser weaving, and twilling. Colored reeds will be offered along with natural reeds. This can be used as a container, a conversational piece, a basket by the door to hold odds and ends or whatever you wish to use it for. Enchanting midnight colors into a basket. A base will be attached to rental mold with spokes inserted, for a quick start and shaping is easy. Then you can concentrate on learning triple twining with a step-up, inserting overlays, and weaving the arrow pattern. Lash with a blanket stitch using wax linen. 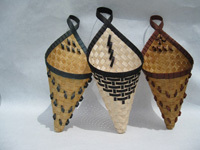 A cone-shaped basket woven entirely of maple wood strips! The weaving itself is a clever combination of both straight and diagonal plaiting. The trick is all in the start. Rim with maple and lash with waxed linen. Curls and overlays complete the lovely design. Color choices will be offered. 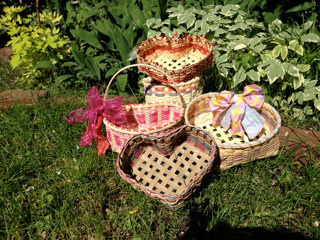 Create your own heart-felt basket using my stash of dyed reeds, cane, ribbons, paper twist and notions! 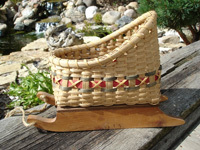 Choose to make your basket with or with out a handle. Pick your spokes from Natural, Smoked or Easter/Spring space dyed flat ½” reed. Twill base to form heart shape and up sett by weaving first two start/stop rows at same time to create stable firm base. Break into a twill if you’d like. Various widths, colors and types of reed can be used in basket body. Rim is your choice - either lashed or twill. 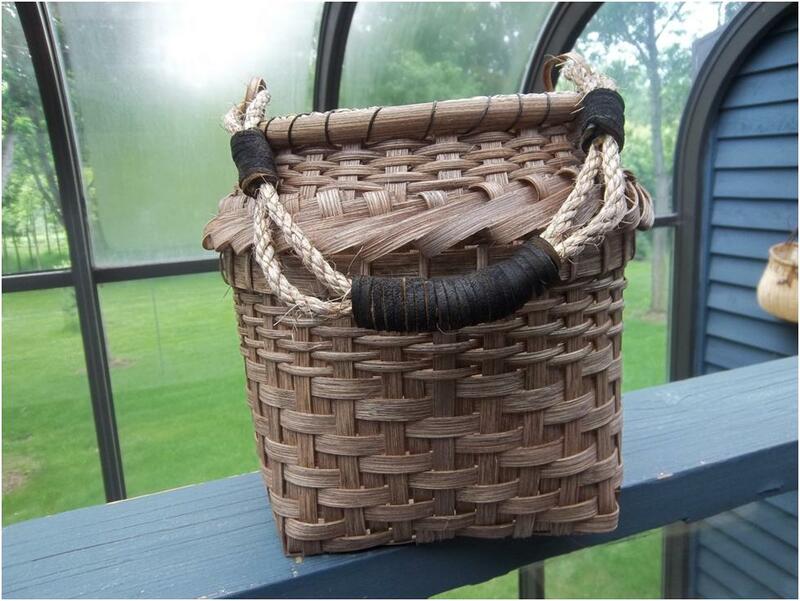 LASH using paper twist &/or seagrass.and learn an easy fancy over-weave or TWILL rim with dyed round reed. 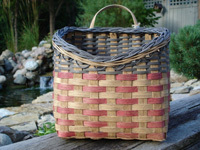 If your basket has a handle – treat it with color and a decorative style! This is a great gift basket for any occasion: mothers day, birthday, friendship, anniversary, weddings! NOTE: no kits will be available. 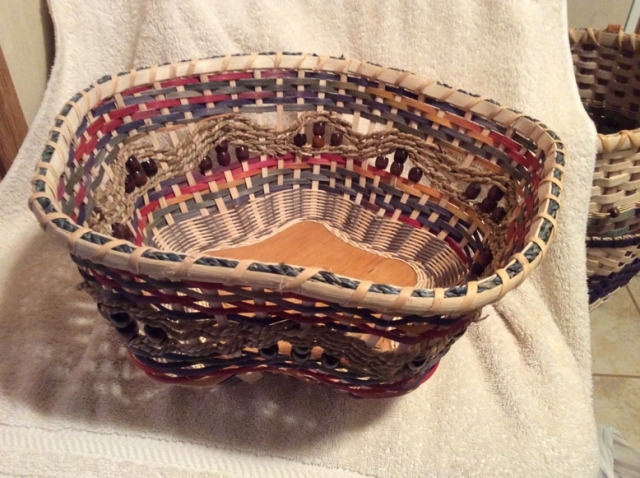 Wall hanging or center top basket that could be used for gloves, mittens and scarves. Fun braided rim to finish off the top. 12" x 6" base with height of 12"
For more information go to the NBO website: nationalbasketry.org The conference will take place at Macalester College in St. Paul, MN registration starts January 15th. You must be a member of the NBO to attend the conference. This class has been canceled - the week-long event will take its place. A tribute to Grace Kabel. Start with a 2/2 Twill base, then 3/3 twill up the sides, add the first rim, then the “Kabel” border, up to the last rim and add a snazzy rope handle. This basket has many different techniques going on. Basket may need to be completed at home, we will make it to Kabel border. The 16th annual Basket Bingo Fundraiser. Play bingo and win baskets! Come and enjoy fun door prizes, food and a raffle. Bring your friends and family, this event is always a lot of fun! Don't miss it! On a plywood base, build a snowman with continuous weave. Add a hat, felt nose, button eyes and buttons for the coat, a scarf completes the look. Please register ahead of time to ensure availability of materials. 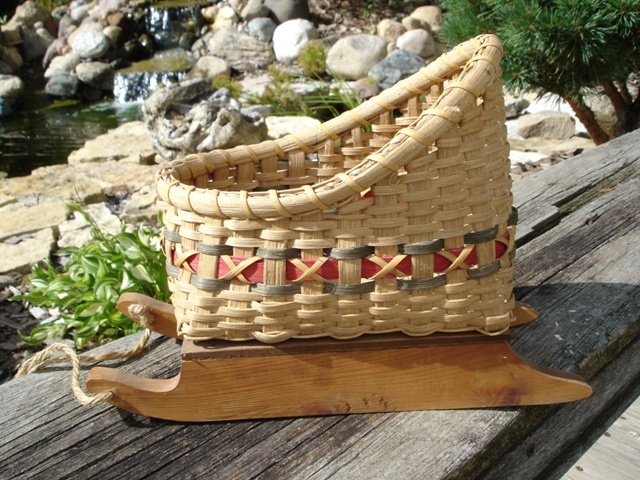 Fun Sleigh Basket that can be used to hold Christmas cards or pine cones. Weave a gift basket for the Alexander House (weaving supplies will be available), enjoy a pot luck, participate in the MBWG Annual Meeting, AND enjoy a basket exchange! Bring a food item for the potluck and a basket for the exchange. 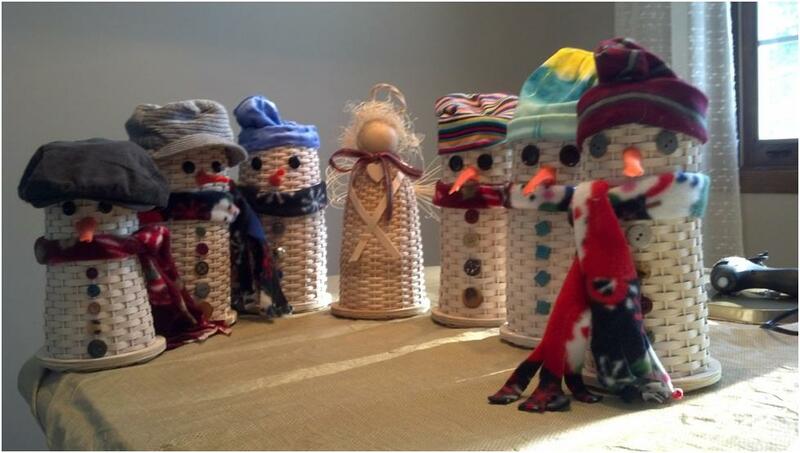 This is a fun seasonal weaving / eating / chatting / gift exchange event you will not want to miss!